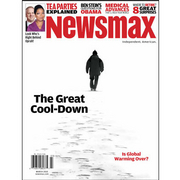 As Newsmax reports, a growing body of new scientific evidence casts serious doubt on the claim that the world is facing a catastrophic rise in temperature — as Al Gore and many climatologists have claimed. They say that warming is caused by human activity, and steps must be taken if we're to sustain life on the planet as we know it. But a significant number of highly regarded climate experts are skeptical, with some even stating that there is a greater chance of prolonged global cooling than of imminent global warming. Republican Sen. James Inhofe has called global warming "the greatest hoax ever perpetrated on the American people." Newsmax magazine's “Great Cool-Down” report takes an honest and in-depth look at the climate change debate, which will have a serious impact on carbon emissions legislation, the U.S. economy, and ultimately, the American way of life. With President Obama still pushing a “cap-and-trade” bill that would cost every American thousands of dollars all in an effort to lower carbon emissions, finding out the truth is a must for every citizen. Is this winter the onset of a mini ice age? Who really is behind the tea party movement?